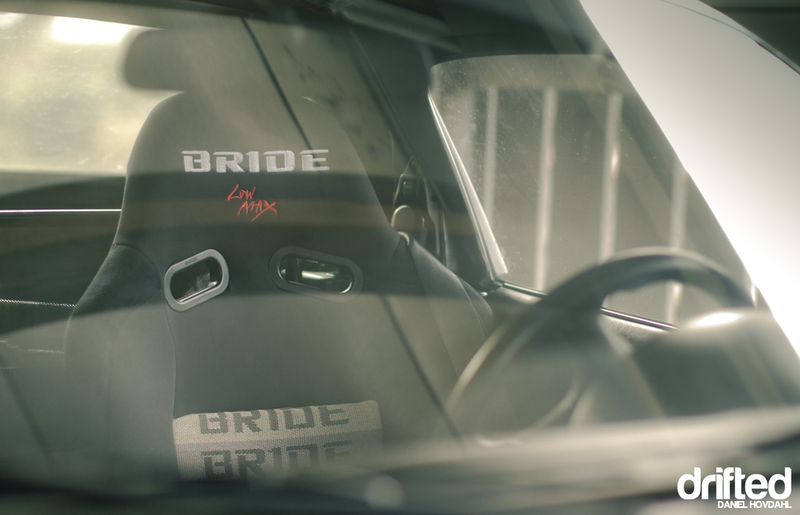 This is the story of a 1995 Mazda MX5 with a low-mileage 1.6 liter engine, driven by a woman. It’s not a rocket; it has a hairdressers’ status amongst the generel public. It’s small, it’s impractical. So why, you ask, why would I want to buy a car like this? Well, let me make it simple. It has potential. Before turning 16 almost 3 years ago now, I started looking for my first car… Actually, I started that process about ten years ago, as far back as I can even remember – I’ve been into cars. Since I have my whole family up North, where Volvo 240‘s are more or less religion, I wanted one since I was little. My uncle had one when I was a toddler, and I have fond memories of that car. 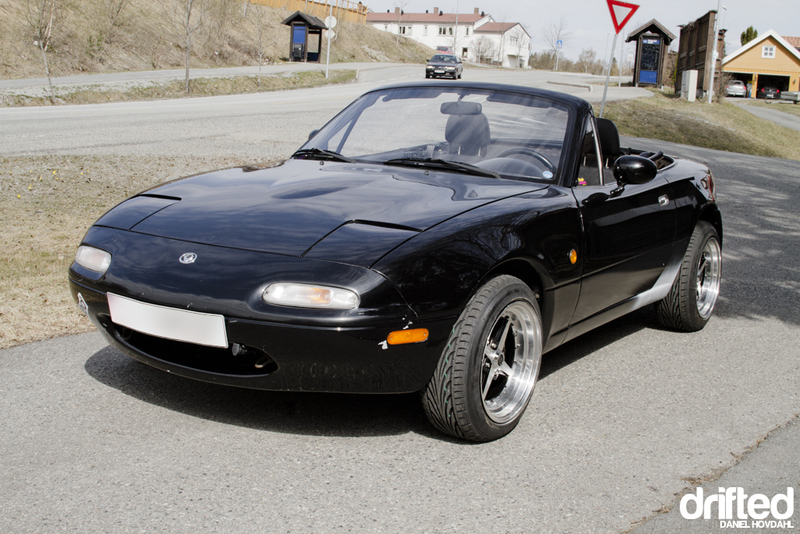 To be frank, I have never really paid any attention to MX5’s before; I was actually drooling over a few 1st Gen-RX7‘s when looking for my first car. 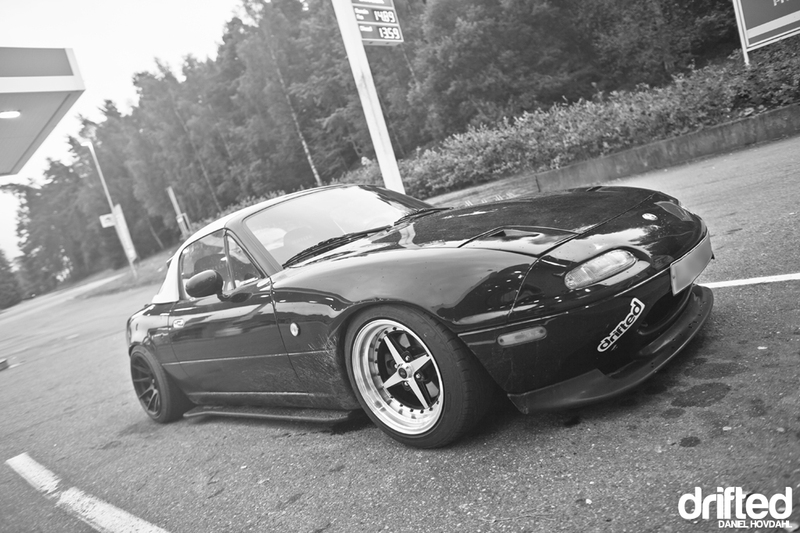 MX5’s have never really been a big part of the tuning/drifting scene in Norway, so I’ve never really been exposed to them. I’ve always known I was going to have at least something rear-wheel drive, that wasn’t even a question. 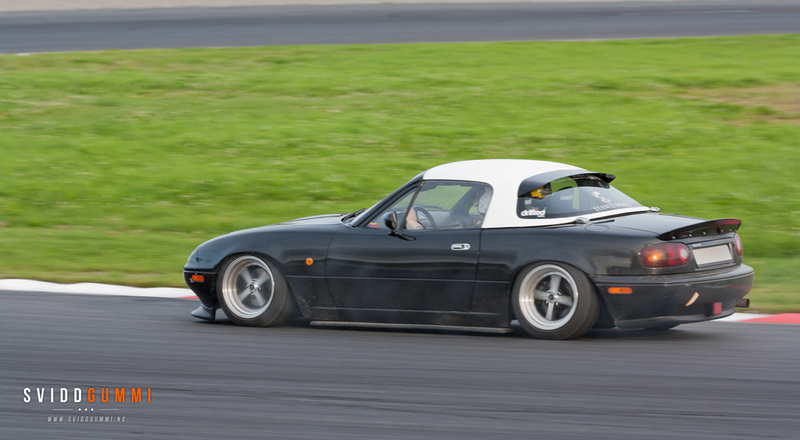 When I found out RX7’s just weren’t going to happen, I started to look at other types of Mazdas. The recipe is perfect. Light-weight, easy to modify with more aftermarket parts than you can fling a rock at, and it’s good looking with a few simple changes. 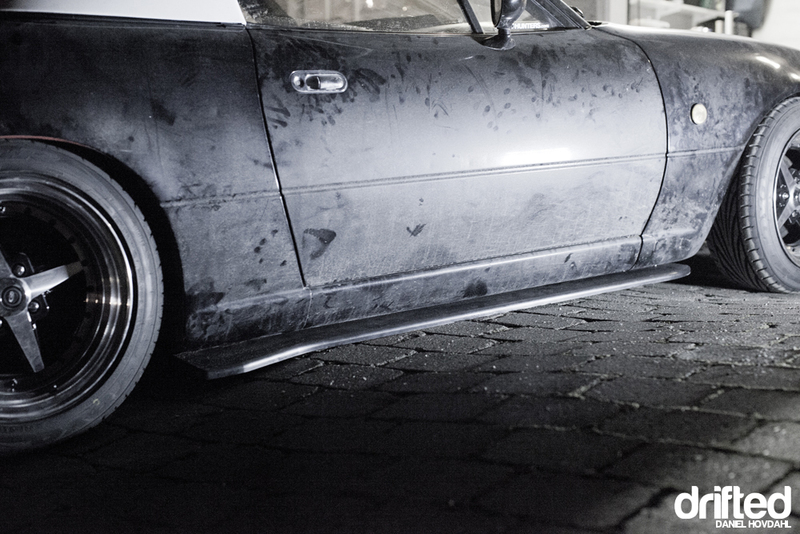 One of the first things to do to an MX5, just like most other cars, is a nice pair of shoes and a fresh set of rubber. Yes, yes… I know, I know, fakes are bad, but at the age of 16, what one can afford is limited. 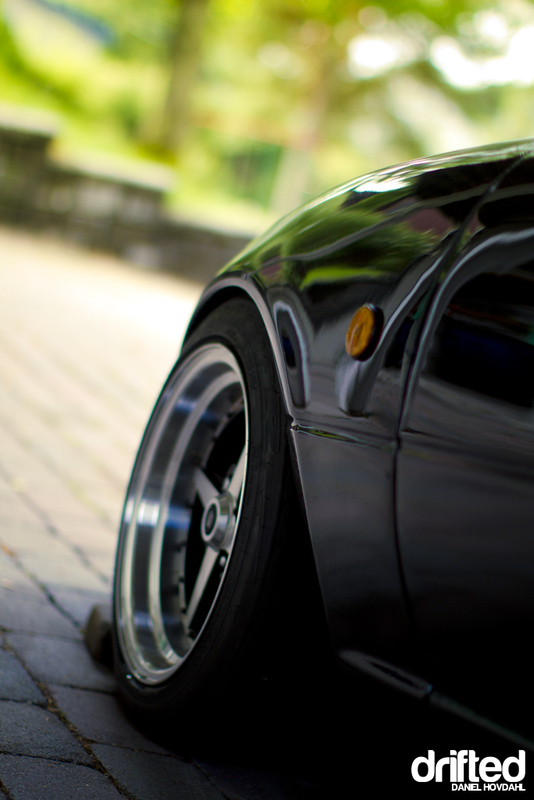 Rota Zero’s 15×8 ET10, wrapped in 195.55.15’s, producing a rather fat tyre combo with a teeny-tiny bit of stretch. That should do it just fine. As embarrassing as the first picture in this post is, I’d say this is worse. You wouldn’t believe the amount of hilarious comments I got for this truck-like stance. I’ll let Drifted’s good friend and fellow contributer’s comment speak for itself. “What the cocking hell is that ?! .. Why have you raised the suspension ?? ..
With that, it was time to push checkout on a few sites… To begin with I got some second hand TA Technix Racelands, to lower the car. I also got a GV front lip to go with it, to add a little more sportiness to the car. 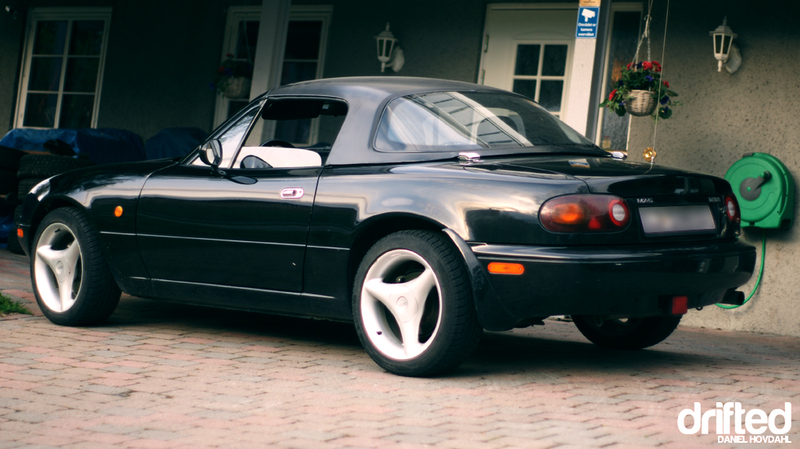 With the TAs on, the ride height was a whole lot better, to say the least. No huge arch gap that could fit a rather large baby in it. But it was still not up to what I wanted. I couldn’t go lower without removing the helper springs, because the perch-rings were hitting the driveshafts on the rear. 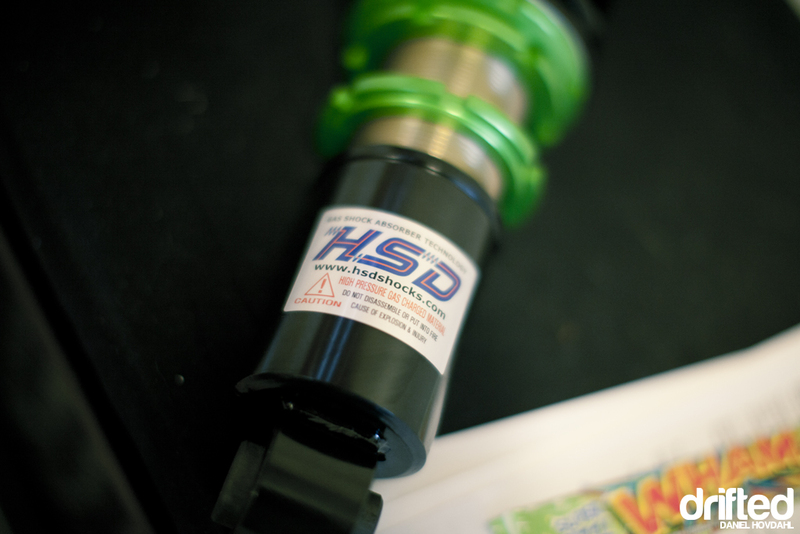 So Driftworks provided me with the rescue, the brilliant HSD’s. Ordered them up and got them on the car. 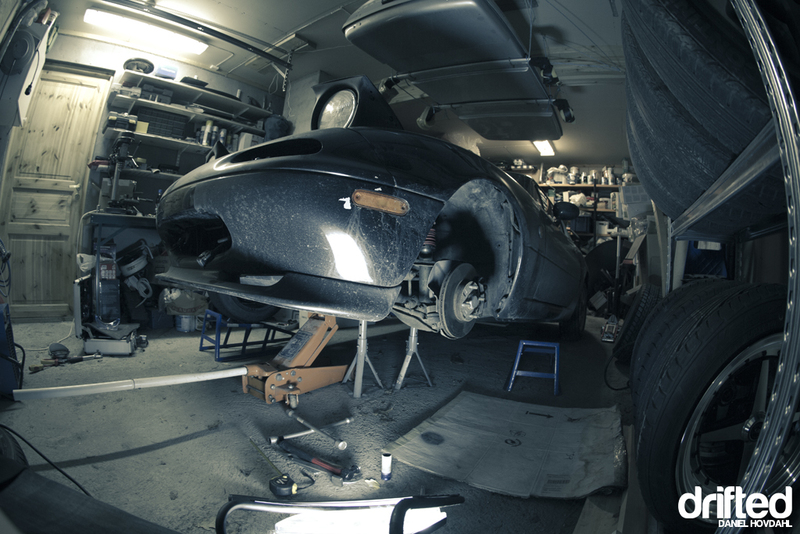 … Yes, I got stuck half a meter outside my garage. Here’s a short vid I made after fitting the HSD’s. It’s now slightly lower. It’s also important to sit comfortable and stylish. 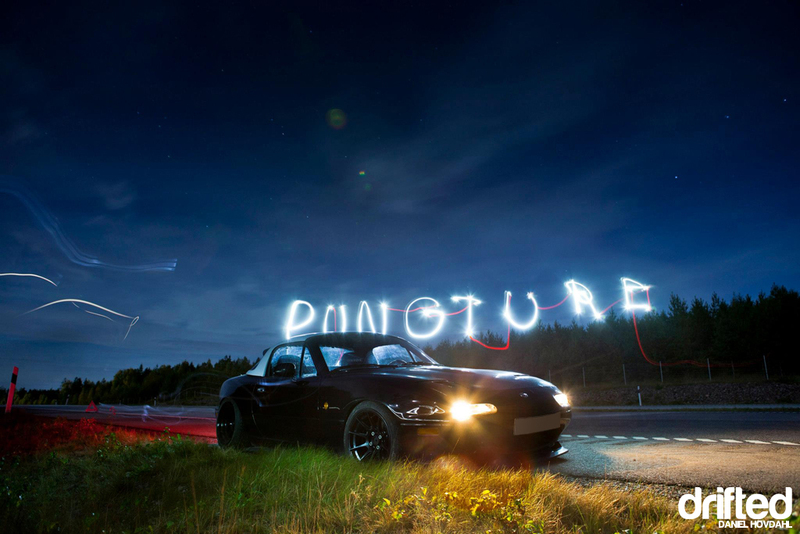 This is one of the more recent pictures of the car, going home from the last Gatebil of the year back in September. 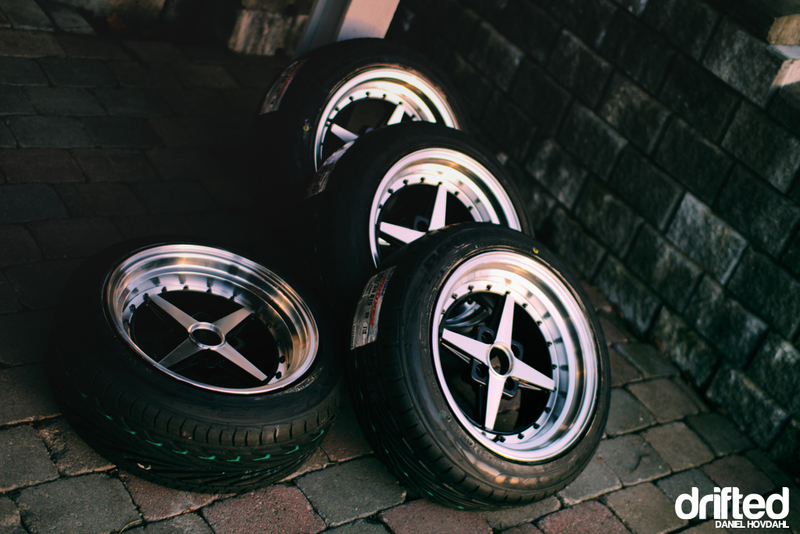 Funny story about the mismatched rims; the rears are XXR 527’s in 15×8.25 with an offset of zero. 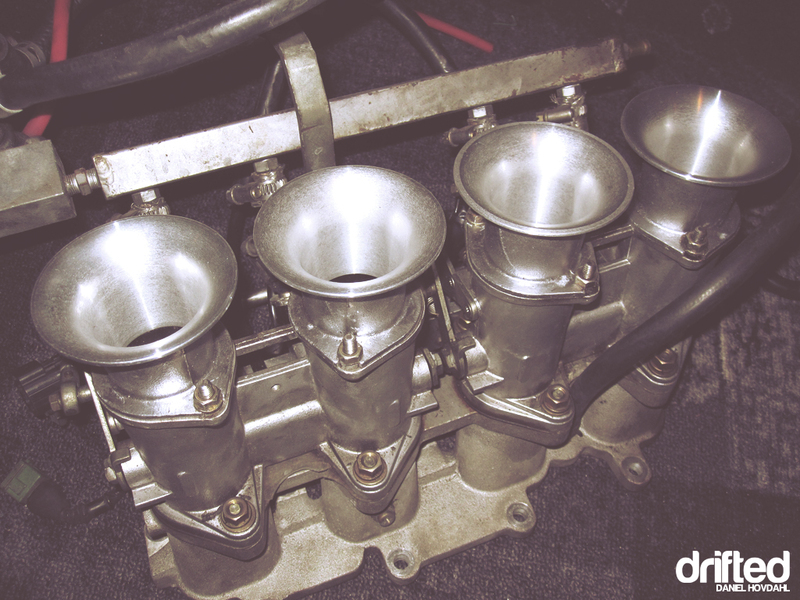 I got these on the night before leaving for Gatebil. A week before that I had just ordered Rota Grid Vs in black. Why? Because I killed one of the Rota Zeros. An expensive week. Here’s my actual first Track Day. Well, I got three laps in at the end of the day; that’s what the media-dudes have to live with. All work and no play! And yup, my front tyre is rubbing on, no, not the outer arch, but the top of the wheelwell. Thanks to Carl Christian Bronken from Sviddgummi for the picture! To the last, how my car stands today. More or less. This though, is with a blown front tyre, If you didn’t get that because of the spelling error, together with Henrik Oulie Media on the way to Sweden. So yeah, that’s my car thus far. Of course, this has been an on-going project for the last couple of years. Not that much has actually been done to it, although I think the look of it has been drastically changed for the better.